With the 4x100m relays complete in the Beijing 2008 Olympic Games, one cannot help but wonder what might have been. Fortunately, the Jamaican men’s team fulfilled expectations and went on to win the gold medal in world record time, a feat which will survive history over the dropped batons. Obviously, in order to win the relay, you need some pretty fast runners. The other essential ingredient is to have clean baton changes. I will attempt to explain the subtleties of this mysterious art to those who are unfamiliar. The baton is usually about 30cm long and a touch thicker than your average empty toilet-roll and constructed of Aluminium. Ordinarily the first runner will start with the baton in the right hand. The baton is then passed to the left hand of the second runner, the right hand of the third and, finally, the left hand of the anchor leg. As carrying the baton doesn’t require a great deal of dexterity, the handed-ness of the runners generally isn’t a deciding factor in allocated legs. The changeover area begins 10m before and ends 10m after the 100m distance mark. A runner may begin accelerating up to 10m before the area begins. The changeover area is the only zone where two runners may be holding the baton. Easy right? Here’s where it starts to get difficult. In order to deliver the fastest time, the best way to do the change is to do it “blind”. This means that the receiver does not see the baton. He or she relies on the previous runner to give some kind of audio signal. On this signal, the receiver holds out an open hand (depending on which leg is being run). The baton is placed in this hand, the hand closes, the previous runner lets go, and bob’s your uncle. Oh, by the way, this all happens in the blink of an eye. 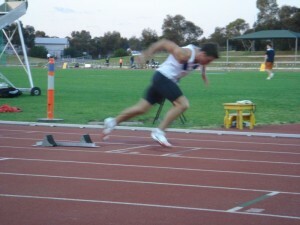 The approaching runner is at top speed and hits a marker on the track (usually a piece of duct tape placed by the receiver – look out for it the next time you watch a relay). The receiver sees the previous runner hit that marker, turns, and begins to accelerate AS FAST AS HE CAN. This is key. As the runners enter the changeover area, the receiver is just coming out of the drive-phase and is approaching top-speed while the previous runner holds speed. If the receiver is running the straight they should be running on the right side of the lane, the giver gives a signal (usually “hand!”) and the receiver’s left hand extends backwards with palm facing upwards. The giver places the baton in the outstretched hand, the receiver grips the baton and the giver lets go. Ideally, their strides will also be matched so that the change happens when the giver and receiver have their left feet forward. There are two main ways to botch this. The giver may let go of the baton before the receiver has a good grip on it. There’s really not much you can do about that other than practice more. The other way is when you have two runners whose speed is very different. The receiver may accelerate too quickly and be out of reach of the previous runner making a baton change impossible. There are various adjustments which may be made to avoid this, and these are largely the responsibility of the coaching staff. About those markers: A coach will usually give a runner two numbers, say 17 and 3. The bigger number is usually the number of steps behind the approach mark (20m behind the 100m distance mark) that the duct tape should be placed on. The smaller number is the number of steps in front of that mark that the receiver should stand and accelerate from. A bigger big number usually means that the approaching runner is quick, relative to the receiver. A bigger small number indicates that the receiver is a fast accelerator. All of this is pointed towards getting the runners to meet at *just* under their top speed with one accelerating slightly while the other decelerates slightly… somewhere in the early half of the 20m changeover area. With regard to selecting runners, an ideal relay runner will have a high top-end speed. People who are good at running the bend, such as 200m runners, or the occasional 400m are usually given legs 1 or 3. The fastest runner is usually the anchor leg, although this is not always the case. For example, I used to run the first leg for my house relay team at school because I was usually the second-fastest runner in my house which made me the second-fastest accelerator and, combined with my good bend-running ability (probably comes from the speed skating) meant that my comparative advantage was greatest as a first-leg runner. However, at university games (more on that later) where I was only a last-minute reserve, I ran leg 3 because there were plenty of runners who could start better (my start is relatively slow, which is why I’m a middle-distance runner). For example, at the Australian University Games in 2006, I was recruited at the last minute to run in this relay to fill in for an injured runner (I was there to run just the 400m, but ended up running the individual 100m, the 4x100m relay, the 400m, the 4x400m relay and the 800m leg of the medley relay). Anyway, I ran the third leg because I was good on the bend. I was given a very standard 17 and 3 as receiver, but the anchor leg, Tom Cade, with whom I went to school, was given 15 and 3, which probably meant that the coach didn’t think I was very fast. (This was partly because he didn’t coach the squad that I trained in). In fact, we were two runners short due to injury, so a long jumper by the name of Robert Commons was recruited to run our first leg (I also went to school with him). Turns out he could still run a very fast 100m (this was certainly true in his school days), and he completely over ran our second runner. The change was so dodgy, that he actually stepped on the shoe of our number two runner, Andrew Boudrie. This hiccup knocked us from 2nd/3rd ish down to about 6th. Boudrie did very well to make up ground and when I received the baton, despite a less than ideal change (it took about four strides from “hand” to his release, rather than 2) we managed to gain a lot of ground. The final change was textbook-perfect. As it happens, Tom and I were not only in the same year level, but also in the same tutor group and had run many house relays together before (although, interestingly, we’d never run adjacent legs). I approached and nearly over ran him, except that from the moment I said “hand” to the moment I let go, I might have taken one and a half steps. As a result, we passed a few teams just in the change and almost made it to the podium. The Americans were not quite so fortunate at these Olympic games. Both men’s and women’s teams dropped the baton. Obviously, there’s a much smaller margin for error at the olympics because these people run so much faster that they spend far less time in the changeover area. Still, you would expect that, at this level of competition, they would hit those changes like clockwork. Instead, they were making rookie mistakes; letting go of the baton too early, running on the wrong side of the lane, even running into another lane in confusion! The Jamaican women’s DQ was particularly disappointing. Gold medalist in the 100m, tied silver medalists from the 100m and the gold medalist from the 200m. Their changeovers looked very dodgy in the preliminaries and the finally dropped it in the final. Even the Jamaican men’s changes didn’t look great. However, when you have the world record holder and the previous world record holder on your relay team, you can get away with less-than-perfect baton changes. It was also very satisfying to see both Asafa Powell and Usain Bolt run for a full 100m (not that anyone believed that they couldn’t), and they smashed the 16-year-old world record by three tenths. This is especially scary, because if they made good baton changes, they could have probably gone a tenth or more quicker.